As summer blends into autumn, I am taking advantage of my lingering tomato and basil harvest. I'm welcoming my favorite season and already incorporating flavors of fall such as sweet potatoes with every meal. After all, here in Southern California, the only sign of one season ending and another beginning is with fruits and vegetables we plant, grow and harvest on the ranch. 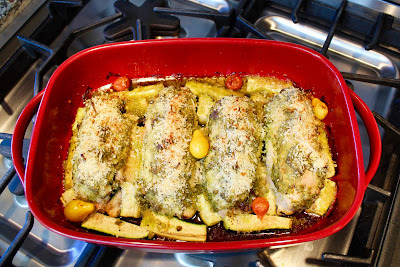 I love basil pesto and therefore once a month, I prepare a jar and use it frequently as my pizza sauce, to dress my vegetables, fish, or chicken. This year, our tomatoes practically took over our garden! Thankfully, my industrial size dehydrated allows me to make my very own sun-dried tomatoes which I seal in plastic bags, store in the fridge and use throughout the year. The gravitational pull of both pesto and sun-dried tomatoes is irresistible to my pallet. Therefore, for this easy to make, stylish recipe I butterflied chicken breast, stuffed them with spinach and sun-dried tomatoes. 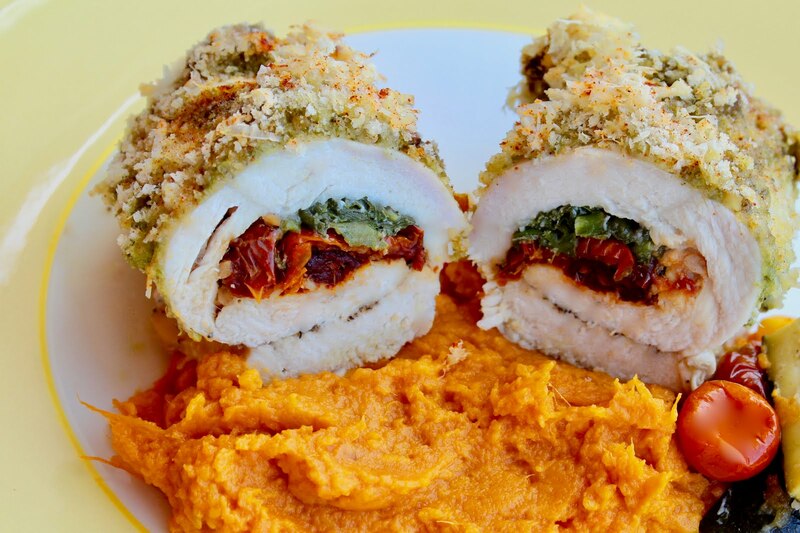 Very easily, I rolled the breast, slathered it with pesto topped with Panko bread crumbs and parmesan cheese. Forty minutes later, a juicy, healthy, elegant, and delicious meal is ready to be devoured. Next time you have guests over, prepare this recipe in advance and simply place in the oven to roast prior to dinner. I guarantee everyone will be impressed! Preheat oven to 425°F. Grease inside of a deep baking dish with olive oil to cover. Place each chicken breast with butterflied cut side up; with a meat mallet, tenderize chicken to create a flatter surface. Season both sides of breast with salt and pepper. Place approximately 2 tablespoon of sun-dried tomato to spread along the shorter end of the length side of the breast. Top with approximately 1 cup of chopped spinach and 1 tablespoons of parmesan cheese. Tightly roll from the spinach and tomato side to the other. Secure chicken breast by placing 2 toothpicks one inch in from the ends (penetrating from the top to bottom). Place in baking dish and continue with remaining three. 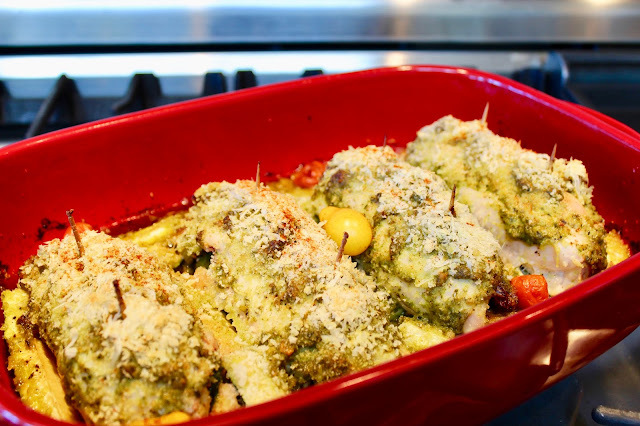 Spoon 2 tablespoons of pesto over chicken to cover all top surface; sprinkle with Panko and remaining parmesan cheese. If using zucchini and cherry tomatoes, place as many as you desire alongside chicken. Cover dish with aluminum foil and bake for 15 minutes covered; reduce heat to 400, remove foil and bake for additional 25 minutes and serve.